What has seemed to be an unusually active spring severe weather season will produce one more episode of severe weather over the next 24 hours. We will once again see multiple rounds of severe storms (hopefully not continuously) beginning later this afternoon/evening into the overnight hours and through Wednesday morning. Unfortunately, this event could be one of the more significant of all of the storms the metro area has experienced in some time. As of 11:30am, the Storm Prediction Center (SPC) has upgraded the Memphis metro area from a Moderate Risk to a rare High Risk. The High Risk extends from northeast of the metro area southwest across southern AR (see map below). A High Risk is generally only issued when there is a magnitude of certainty that strong, long-tracked tornadoes or very strong wind that will produce widespread damage will develop within the risk area. The threat levels for all severe weather parameters are shown at the end of this post. Severe weather risk areas through Wednesday 7am. A High Risk is rare. As far as how we expect this event to play out, storms will begin to develop over southern AR by late afternoon and move/develop quickly east and northeast towards the metro area this evening. Supercell thunderstorms are possible in the area after 5pm with an enhanced threat during the late evening hours - say from 8pm to midnight. Any storms that form could produce damaging straight line wind, hail, and tornadoes. As SPC indicates, there is uncertainty with the downstream development of the storms in AR during the evening. They could remain supercellular, which would heighten the tornado threat, or they could coalesce into a squall line that would heighten the damaging wind threat. During the overnight hours, thunderstorms will remain likely though at this time there is no "likely period" or "trigger" that we can hang our hat on as far as organization of the storms. All modes of severe weather will continue to be threats throughout the nighttime hours. By morning, the developing low pressure responsible for all of this severe weather will be moving across northeast AR into the mid-Mississippi Valley and will probably bring one more round of severe storms during the post-dawn hours, or sometime between 7-11am. Another squall line is probably a good bet, though there will be enough wind shear to produce tornadoes as well. The back edge of the rain and storms should be moving out around the lunch hour on Wednesday with much more pleasant weather in store for Thursday and Friday! The final threat to mention is not the least and cannot be overstated. The ground is already saturated. All of these storms will have very heavy rain, which could be prolonged. Flash flooding is a serious threat and is exacerbated at night when it is difficult to impossible to gauge the depth of moving water. Do NOT cross flooded areas by foot or in your vehicle. Twelve inches of moving water is enough to sweep a large vehicle off the road into a rushing culvert and you can't be sure the road you want to drive across has been washed out under the flowing water. "Turn Around, Don't Drown" is the message. All Mid-Southerners should prepare for an extended period of severe weather and possible long-duration power outages. This storm system has the highest potential to produce severe storms that we have faced in some time. Please read over these safety tips published on the blog last evening, then visit the MWN Storm Center for additional safety information. 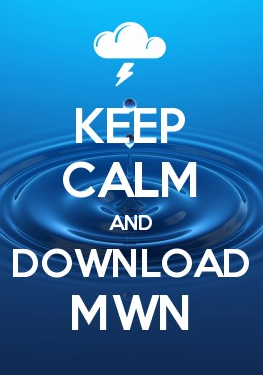 Be prepared, not scared, and stay with MWN for the latest. Our website has all of the information you need to stay informed and remain safe. FINAL NOTE: MWN is a small operation and we do our absolute best to keep you informed during severe weather events. Please review our severe weather coverage policy and understand that we cannot answer every question posed during ongoing severe weather and apologize for this in advance. We will do our best to cover the most intense weather via social media, but there is no "second shift" to call in. Some sleep is a necessity in order to think and function properly during severe weather. :-) Thanks for understanding.